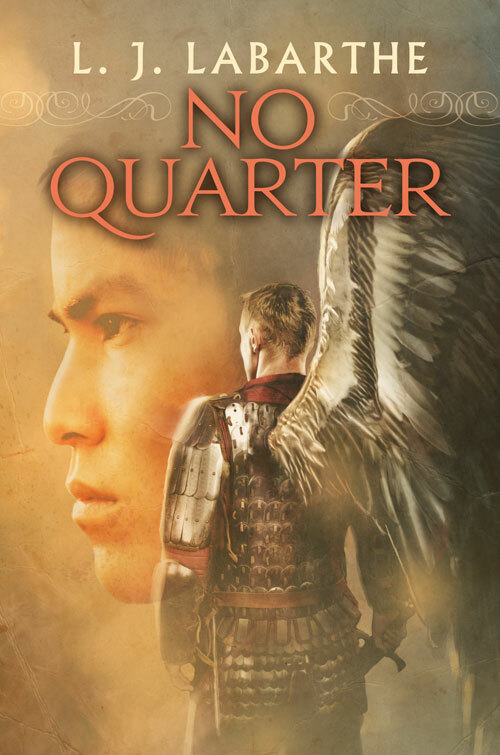 » “No Quarter” Day: Excerpt the Second. “No Quarter” Day: Excerpt the Second. A short excerpt this time, a quiet moment between Michael and Gabriel. Gabriel rolled off him and onto his back, shifting to get comfortable. Tugging Michael into the curve of his arm, he smiled to himself as Michael curled up around him, a leg thrown over Gabriel’s and an arm slung over Gabriel’s chest as Michael rested his head on Gabriel’s shoulder. “Oh?” Gabriel shifted a little so he could look into Michael’s eyes. “Yes. Gabriel, I… I love you.” The last three words were said in a rush. “You do not have to say—” Michael began, but Gabriel cut him off. Michael hummed and nodded once. “I think I will. A short nap. You will be here?” The hopeful note in his voice was not lost on Gabriel. Michael smiled at that. “Thank you,” he whispered. Michael stretched and yawned, rubbing his eyes with the heel of one hand. It was an almost childlike action, and Gabriel couldn’t help but smile. “As you say,” Michael agreed. “Thank you both for staying with ’em,” Gabriel said, shaking Remiel and Samael’s hands. “Shateiel and his bonded stopped by,” Remiel put in. “Really?” Gabriel’s eyebrow shot up. “Why?” Shateiel was mute, but able to communicate telepathically with angelkind and those sentient beings who had the ability of telepathy. “Mayhap Raziel can answer it for you.” Samael chuckled. “Or mayhap we could cease gossiping entirely,” Michael said.